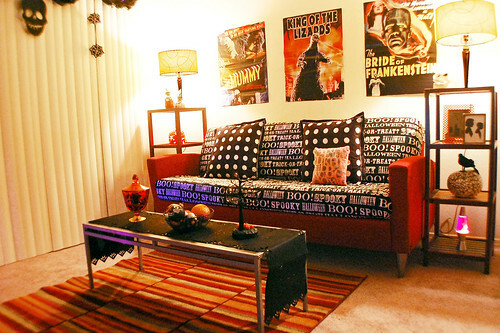 My friend Silvia came over this weekend and we whipped up my living room into spectacular and spooky shape! 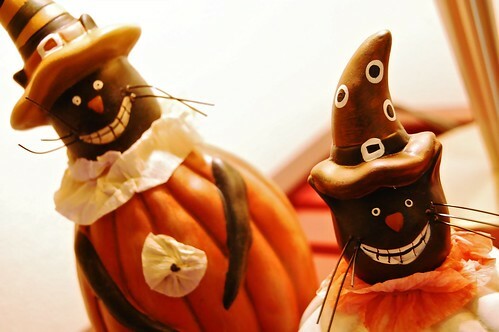 She is a genius at decorating and adding all the right little touches. Our heads wrapped together created this wonderful scene! The most striking thing I think was her idea to use the tablecloth from Target as a slipcover. Freakin’ GENIUS! 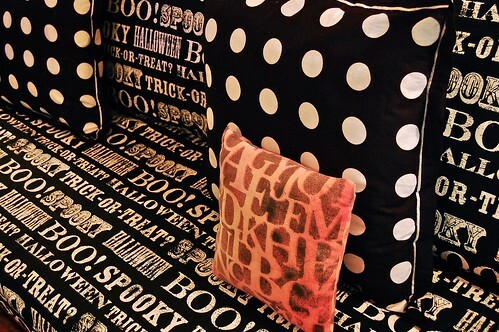 It makes my couch look totally cool and perfect for Halloween entertaining, don’t you think? Here’s other little touches I love about our arrangement! You may recognize this little guy from my post on Friday. In the center of my coffee table is a bowlful of sparkly, shiny, and polka dot balls I have both made and held onto for crafts and for special little arrangements like this! 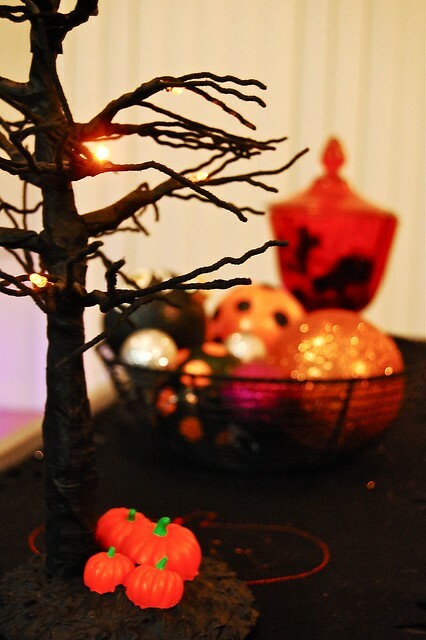 This is the spooky tree my friend Donna Bush got me a couple years back. I love it. It has tiny little lights and I love the wicked-looking branches! I put my Grandmother’s candy dish on display. I love it so much. 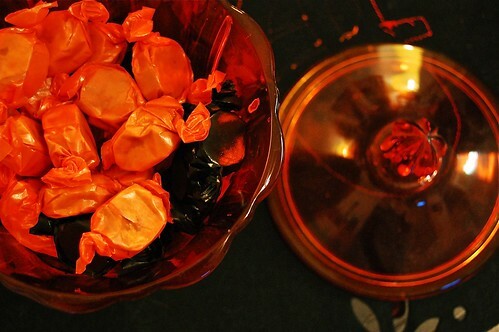 She always used to put starlight mints or butterscotch in there, but I went with one of my favorite holiday candies – orange and black Mary Janes. I actually gave away my clear Anchor Hocking pumpkin jar in exchange for this orange one…I filled it with orange lights and it makes it look super pretty! My friend Diane got me these adorable cats a couple years back for my b-day. I love their silly expressions. 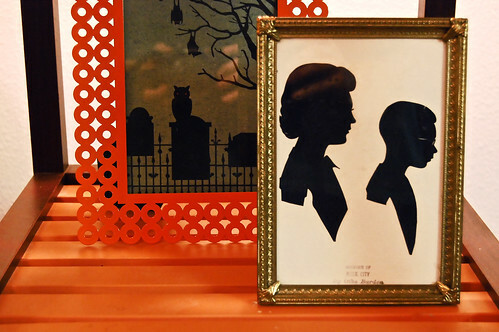 Silvia put in my orange frame a piece of Martha Stewart scrapbook paper and I mixed in one of my favorite accents – silhouettes of my Grandmother and Dad from Rock City. I wasn’t sure how this wasn’t going to look at first, but I think it turned out cute! I glued black trash bags together as drapes (how inexpensive is that??) 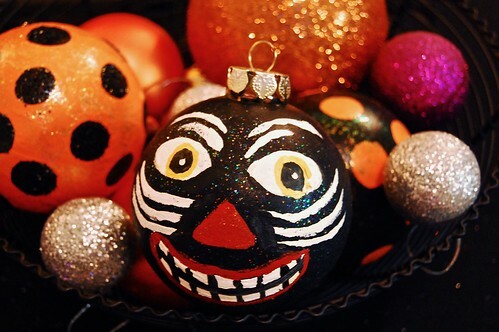 I then accented them with decorations I had in my decorations bin. I love my lava lamp, a gift from my friend Jeff a few years back. 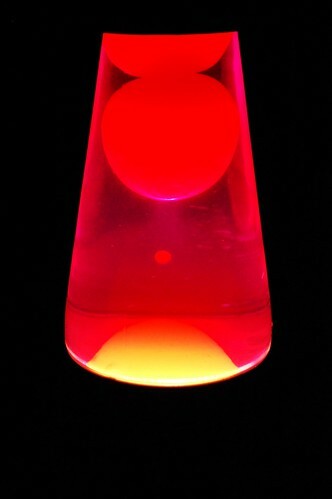 I always think lava lamps put off a funky/eerie mood when they glow in the dark! My posters are from Deals (a subsidiary of Dollar Tree) 4 years back for only a $1! One of my best deals (pun intended) to date. They are a bit wrinkled cause the backer cardboard they were on bent, but it actually adds a cool, distressed look to it. 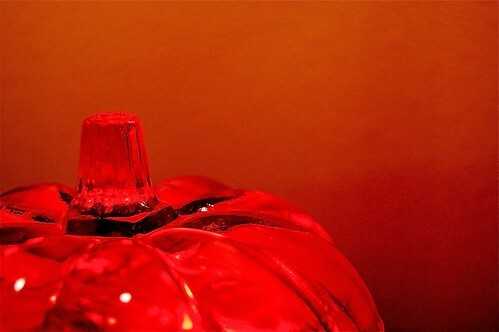 Here we are back at my Halloween couch. Isn’t it cool how graphic it looks with the words and polka dots, Silvia added a pop of color with the mini pillow I made a few months back. Silvia made the comment that I had a lot of stuff. Whenever people say that, I always say, “No I don’t”, but admittedly now I realize that I kinda do. That is what is good about putting a look like this together. It’s fun to mix and match and try to see what works. 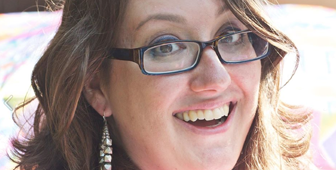 If you are limited on your accents, it makes it a lot harder! It feels good to have things look so complete in this little area! I haven’t got my whole apartment decorated, but I have a lot more cool ideas to execute so I’ll keep you on the down low when I get them completed! 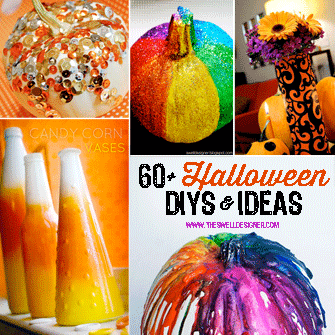 I added these to the following linky parties! It looks fantastic! You two did a terrific job and I can’t wait to see what you come up with for the rest of the apartment. Really cool! I like how it looks! Fabulous….love how the sofa changed…clever idea! 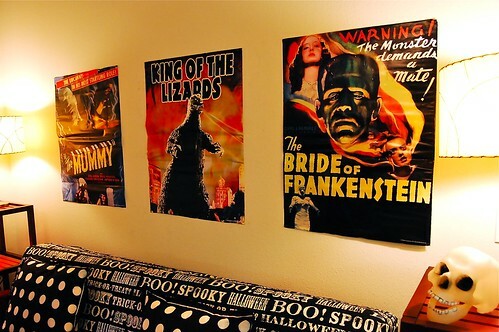 love your halloween slipcover! i’m featuring it today! 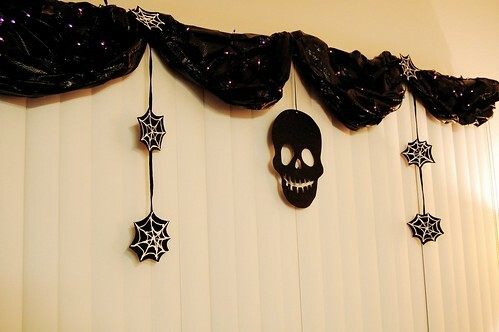 great decorations!